Going to the movies is one of my favorite pass times. Its something I've loved since being a wee lad. The excitement of seeing a movie I've longed to see, the act of arriving at the cinema and seeing the movie's title on the marquee along with its poster, the smell of popcorn, the rush of sitting with a crowd of people who are also excited to see the movie, and the dimming of the lights, all play into my life long love for the cinema experience. Studios (specifically 20th Century Fox) are now vying to alter that experience, they want to stop distributing archival 35mm prints. The notion is to shift to only digital projection. Reasons for doing this are plain and simple, cost. Storage, shipping, and sustaining the 35mm film print is more expensive than digital. While I can understand the dollar and cents mentality the studios have, my appreciation for 35mm film and the people who operate and care for these prints outweigh the financial reasoning. There is a human element, a sense of pride and real care projectionists put into screening a film print for an audience, something that could eventually vanish with this digital transition. One place that takes pride in the fact they only screen 35mm film prints is the New Beverly Cinema in Los Angeles California and they have decided to start a petition urging studios to continue producing and distributing 35mm film prints. Guess what, you can help! Take a look below to see how you can help the New Bev and other revival theaters around the country continue to showcase cinema that makes up the fabric of film history from around the globe. Julia Marchese, a passionate employee of the New Beverly Cinema and cinephile alike started the petition after reading the press release from 20th Century Fox. Julia's vehement response to the Fox decision on her blog is one I share. I do not want to see film projection turned into a simple button pushing task that requires no skill. Since the Industrial Revolution, we've seen machines take away the human element of work. Slowly but surely working our way from craftsmanship waving a banner reading production and efficiency, but truly representing cutting cost. 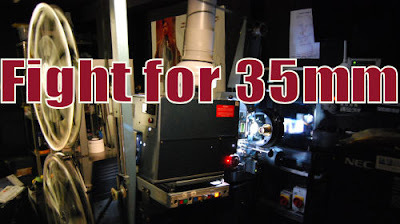 Projectionists have a real passion for film, something that I believe rings through when I watch a 35mm film projected. Why? I know that someone has previewed each film beforehand. They've prepared it for my viewing. They also sit throughout the screenings ensuring the projection and sound quality are at their best. Taking on that job is someone who adores cinema and I want that person continuing to have a job. You reduce film projection to button pushing, hard drives, and digital projection, you'll likely take away all the pride projectionist have in their job thus losing the position altogether. If there is no skill, you can hire anybody to do the job, hell you could even make the system fully automated. As I'm hammering home, it wouldn't be the first time industry removed the human element. The human element is something that the folks at the New Beverly Cinema are really good at. When you are there you can feel how important film is to them. Everything from the programming to concessions has the patrons in mind. Their programming at times can be overwhelming because they can fill a calendar with nothing but amazing programming you do not want to miss on a big screen. I'd hate to think that the New Beverly would be unable to continuing screening awesome archival prints because Fox wants to cut costs. There is real history in those prints. History that deserves to be shared, maintained and then shared again and again for new generations to enjoy in a theater. Please help this cause and sign Julia Marchese and the New Beverly Cinema's petition by visiting Fight for 35mm today!